He was one of America's true greats. As president, he changed the world, developing a successful strategy for defeating Communism, toppling the Soviet Union, and liberating Eastern Europe (while hardly firing a shot). And just as important, he restored an America that had found itself mired in a malaise of falling living standards, moral decay, and what seemed like inevitable decline. Though he was our oldest president, Reagan acted as a tonic, rejuvenating America's economy, restoring her confidence, and attracting a majority of young voters won over by his vision of making America once again a shining city on a hill. 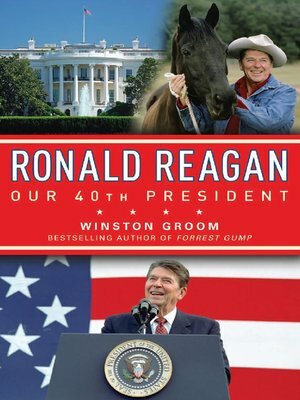 In this superlative biography for young adults, bestselling author Winston Groom—author of Forrest Gump—gives us the full Reagan, from his Midwestern American boyhood, to his early career as a radio sports announcer, to his days as a Hollywood star and his extraordinary political career as a union leader, governor of California, and president of the United States. Covering the gamut of Reagan's dramatic life, Ronald Reagan: Our 40th President is essential reading, as inspiring as its subject.